One of my least favorite islands that I visited in the Caribbean. But did I still buy postcards there? You bet I did! :) Didn't get to see a plane flying over the beach like this though. Thank you for sharing your wild card. 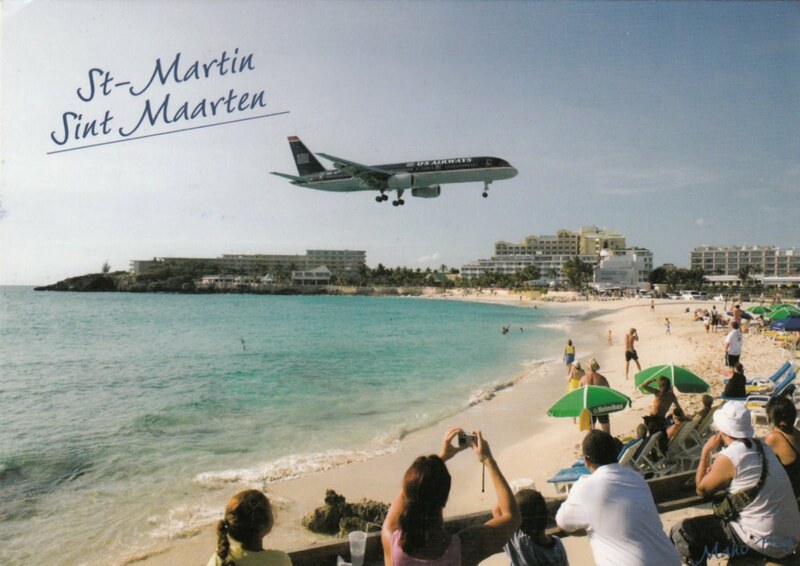 Spring has temporarily come to the San Francisco Bay Area but still, St. Martin looks SOOOOOO inviting! I recently saw a show "Top Ten Worse Airports" and this one was on it!!! There is a bar, not far from where the photo was shot that actually lists the departing flights so that you know when avoid the blowing sand created by the jet engines as it prepares to take off. Also, there are actually those who will line up and hang on to the fence along the beach (which is about a football field length from the jet) to see if the exhaust from the departing jets will blow them off (which it did most of the time)...bets are actually placed at the bar to see who can hang on the longest!!!! It was crazy to watch! I have to second the sentiment about St Martin sucking. The people were rude, even threatening towards any tourist who dared leave their resort. We had a car for the week, and tried to visit the whole island, and this beach was dirty, but of couse we had to see the planes landing. Scary! And so loud!